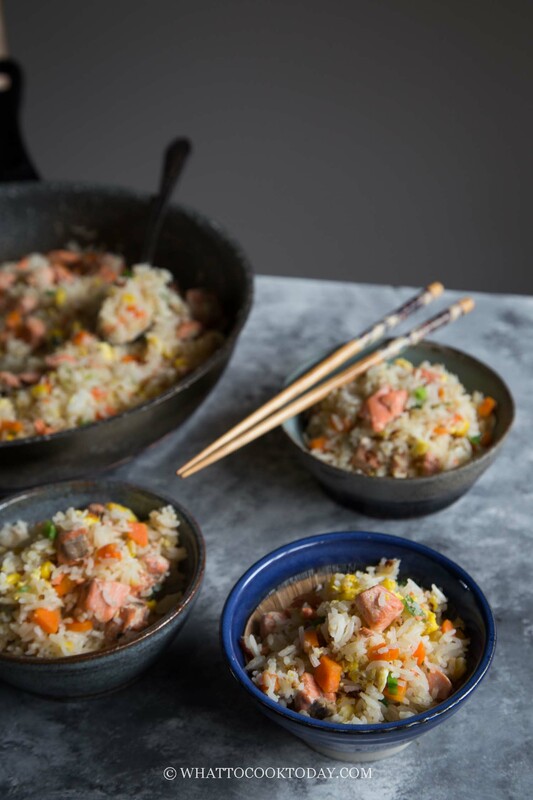 Easy One-Pan Miso Ginger Salmon Fried Rice – Learn how to make super delicious and easy Asian fried rice with salmon marinated in miso paste and ginger along with other vegetables. Perfect for a busy weeknight and great for meal prep too. 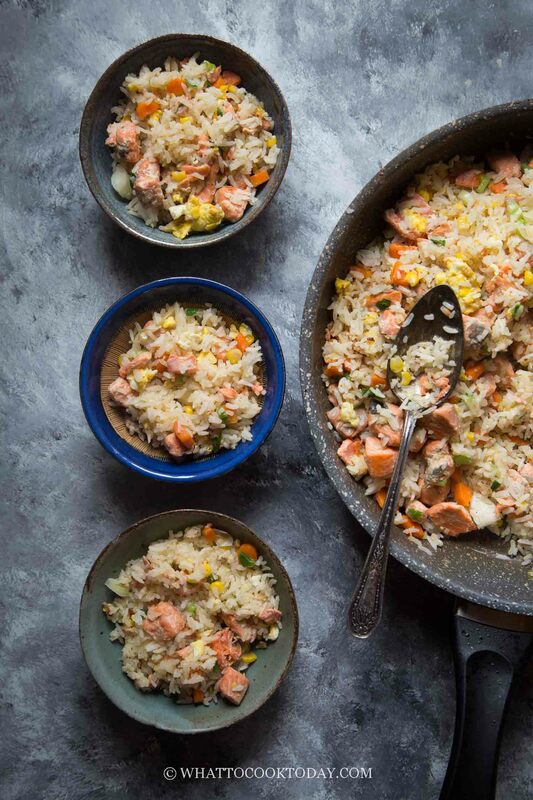 There’s really no fixed rule when it comes to fried rice. You can add pretty much whatever your heart desires. 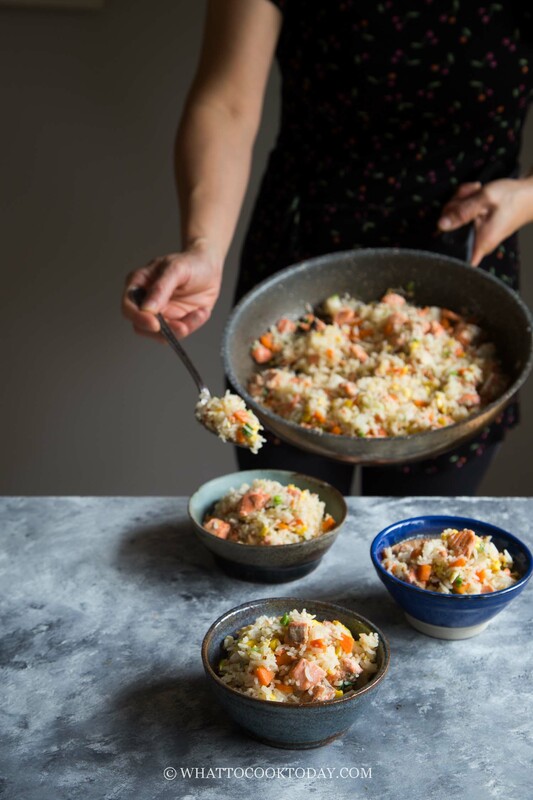 But, there are few basic rules to make sure you get a good fried rice! Not the kind where all the rice clumps together or mushy! Yes, it’s no secret! Good fried rice starts with a good rice. 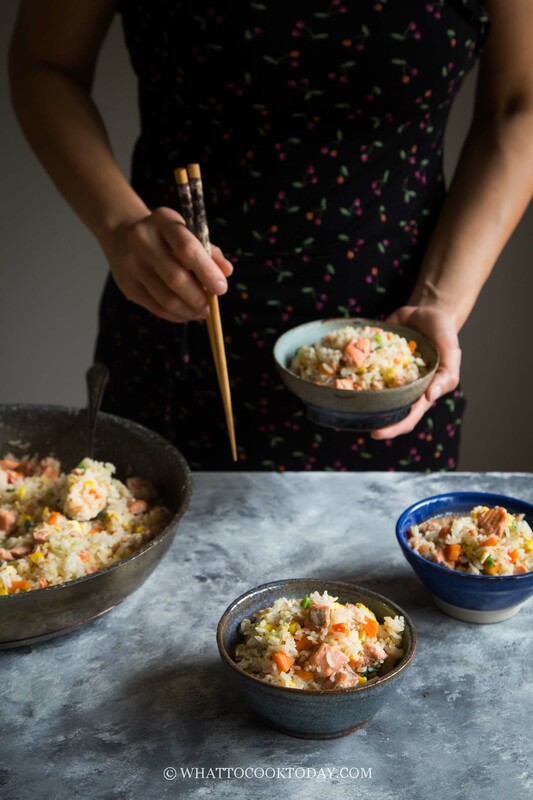 Ideally, overnight or leftover rice is best. 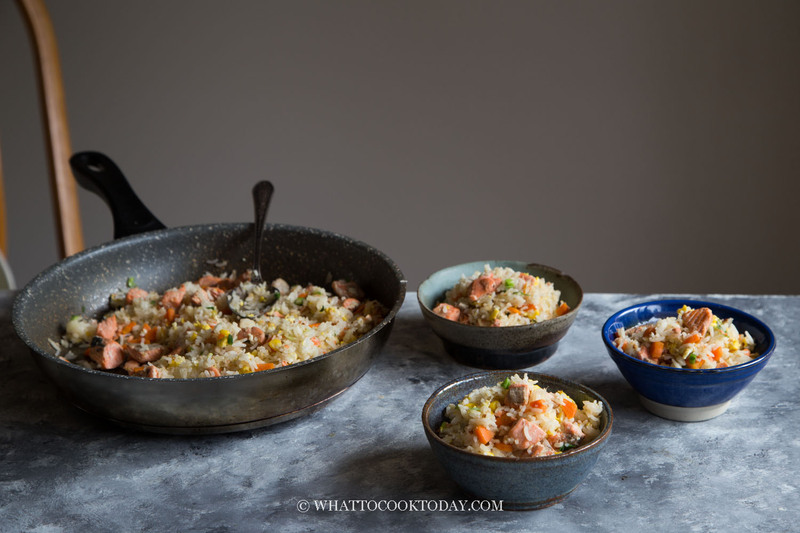 CAN I MAKE FRIED RICE WITH FRESHLY COOKED RICE? 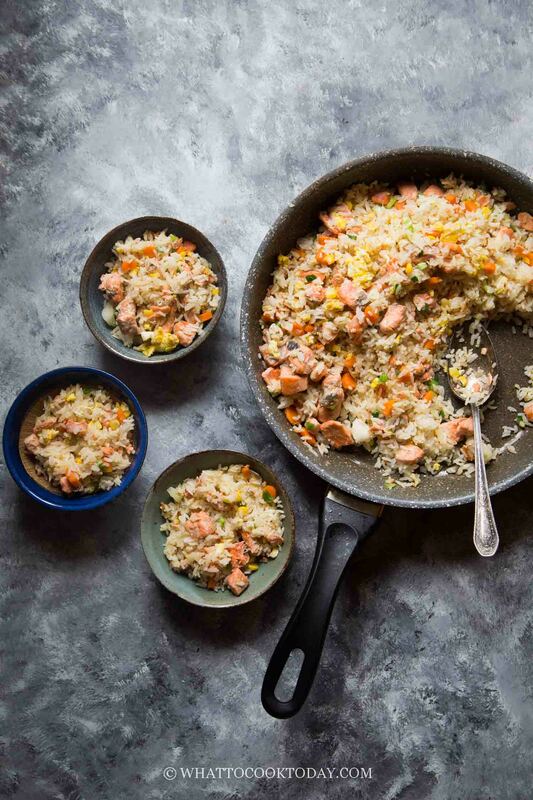 If you don’t have leftover rice and want to make it on the same day, it’s still possible. Make sure you cook the rice at least 2-4 hours before you plan to serve it. 4 hours would be ideal. Once the rice is cooked, immediately spread it out on a sheet pan to let it cool down COMPLETELY. If you have a mini fan that you can use to blow on it, use it. If not, it’s not a big deal either. If you let it sit in the pot or rice cooker, the rice tends to clump together when you stir-fry it, because of moisture. The recipe makes about 2 servings. If you want to double up to 4 servings, you can, but that’s the max I would recommend. Why? It’s hard to maintain good heat when you overload the wok/skillet. When you cook too much at one go, it just won’t taste as nice. The heat is compromised, the seasonings probably not evenly distributed. Fresh or frozen salmon in this case is acceptable. Marinating the salmon in miso and ginger really adds a nice kick to it. My mom (and most Asian) likes to include ginger in seafood recipe because it helps to reduce what people call a fishy odor. 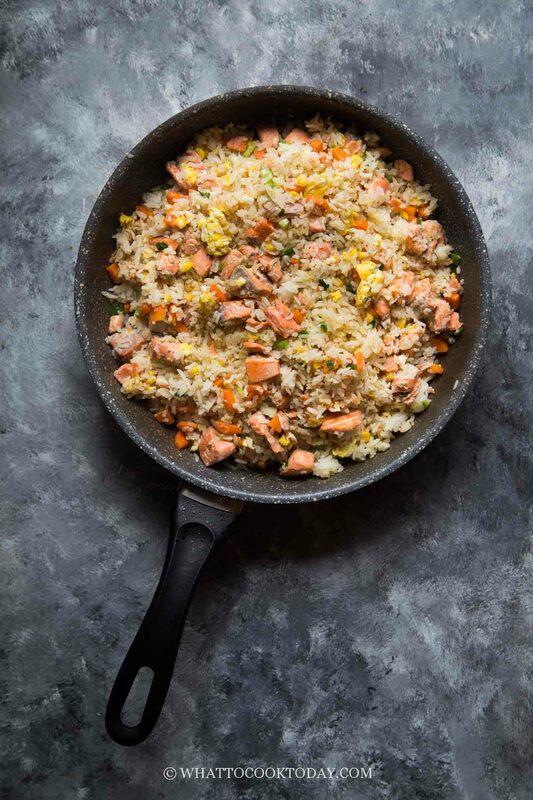 CAN I MEAL PREP WITH THIS SALMON FRIED RICE? Yes, this is perfect for meal prep. Just portion them out into individual container or freezer bags and they can stay frozen for up to one month. Just reheat without thawing in microwave or stir fry it on the wok/skillet. 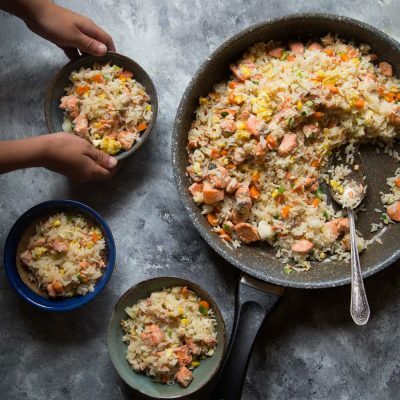 Even my kids who don’t really care for salmon on its own (well, depends on how I cook it), really love this one-pan miso ginger salmon fried rice. They polished their bowls clean! I loooove anything with miso paste in it. It just has so much wonderful flavor. And fried rice is always yum. Great dish for meal prep! I’d love to see some before and after pictures! !